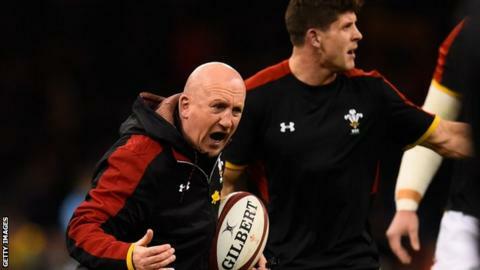 Wales defence coach Shaun Edwards will work with both Ospreys and Dragons next season on a part-time basis. Edwards has been linked with a series of jobs including the England defence role, Harlequins head coach and with rugby league's Wigan Warriors. However, Wales coach Warren Gatland has confirmed Edwards will link up with two Pro14 Welsh regions. "My understanding is Shaun is going to do some work with both the Dragons and the Ospreys," Wales coach Gatland said. Edwards helped the Cardiff Blues lift the Challenge Cup this season in a consultancy role. Dragons coach Jackman has met with Welsh Rugby Union officials and while the move is to be officially completed, Gatland confirmed Edwards' plans. Edwards' arrival and defensive nous would be a major coup for the Dragons who conceded 94 tries in 21 games in the Pro14 this season, where they won only two matches. The Dragons have signed Wales forwards Ross Moriarty and Richard Hibbard as they bid for a drastic improvement in Jackman's second season in charge. Edwards was assistant coach and head coach at Wasps before taking up his role with Wales and is contracted with the national side until the 2019 World Cup. Gatland says there will no no split-loyalties for "professional" Edwards. "If he does work with the Dragons and the Ospreys then it's looking at the bigger picture," Gatland continued. "Those teams are rivals when they play each other, but we're all a part of trying to make Welsh rugby successful and knowing how professional Shaun is he's not going to be giving away secrets to other teams. "He's going to improve them and both sides will have a huge benefit out of him." Edwards has been defence coach with Wales since 2008 and is contracted to the WRU until after the 2019 World Cup, but he was recently interviewed for the Quins role. Gatland was happy for Edwards, who has helped win two Grand Slams and a Six Nations title in his decade with Wales, to look at other jobs. "My attitude to my staff and coaches is that if opportunities come along, you've got to look at them if they are the best option for you and for your family and the future," said Gatland. "You have to realise these coaches are going to be out of a job post World Cup and this speculation is coming around now because there's an acceptance that is going to happen. "They have to start thinking about their futures, their families and what's going to happen. "If opportunities come up I've no issue with coaches exploring them." While Edwards has been heavily linked in recent weeks with multiple vacant roles, Gatland insists the 51-year-old is happy in the Wales setup. "People say these sorts of things are disruptive, but they aren't at all," Gatland said. "Players and staff are used to them and we've all been through situations where coaches have changed. "Having chatted with Shaun his attitude is that he wants to be here for the World Cup, but that he wants to be thinking about what happens after that. "If something comes along before that then he potentially needs to consider it and I'm completely okay with that. "It's not an issue and it's no different to conversations I've had with my staff in the past, or players who have left Wales. "You have to make your best decision from a rugby point of view but also for your family. "With Shaun there was the Harlequins thing and there's been talk about other codes and England as well. But I'm very comfortable, we've worked together for a huge number of years and I've got a lot of respect for him. "If there is potentially an offer there that is life-changing, then I'm comfortable with that. I'd love him to stay."